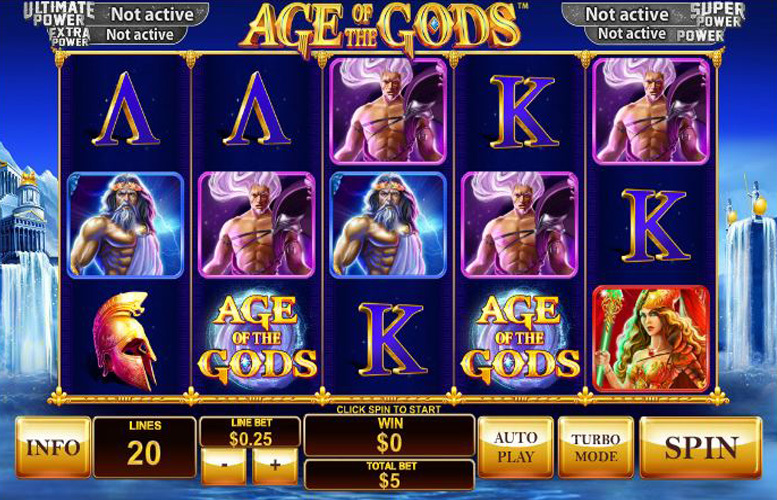 One of a number of Playtech’s similar themed games, Age of the Gods is a five reel and three row slot that invites players to mix it with the all-powerful gods and goddesses of the Greek pantheon. Linked to no fewer than four potential progressive Jackpots, the fun slot also offers its own generous payline jackpots and a whole host of additional features to keep things interesting. Those include traditional wilds and a bonus game which can trigger one of a plethora of differently themed types of free spin. Being linked to the Power, Extra Power, Super Power and Ultimate Power progressive jackpots gives Age of the Gods players the chance to win truly life-changing money. A fun bonus game that can trigger different varieties of free spins is both really fun and potentially very beneficial. The Greek gods theme is innovative and stands out from the crowd of other slot game options. A top payline jackpot of £20,000 is a little stingy when compared with payouts offered by other similar slots. Having a set 20 paylines and not allowing the selection of a different number of coins to bet per payline makes staking options a little limited. Putting the four progressive jackpots to which Age of the Gods is linked aside, the maximum possible payline jackpot results when five of the game’s most valuable symbols line up along one of its 20 paylines. That most valuable symbol is the Age of the Gods wild and when a five symbol combination is achieved, it pays out at a rate of 10,000 times the player’s chosen bet per line. If a player is betting at the highest possible level of £2 per line, therefore, the top jackpot would be worth £20,000 which is certainly not to be sniffed at. There are loads of additional features packed into the Age of the Gods slot, and that is what loads of players love about it. Those additional features are namely the slot’s wild symbols, the bonus game which can trigger free spins and the linkage to four separate progressive jackpots. The most valuable symbol in the game, as far as payline combinations are concerned, the Age of the Gods wild also works in the instantly recognisable fashion of all traditional wilds. That is that it substitutes for all other symbols when it appears on the reels, to make up the most beneficial possible combination. 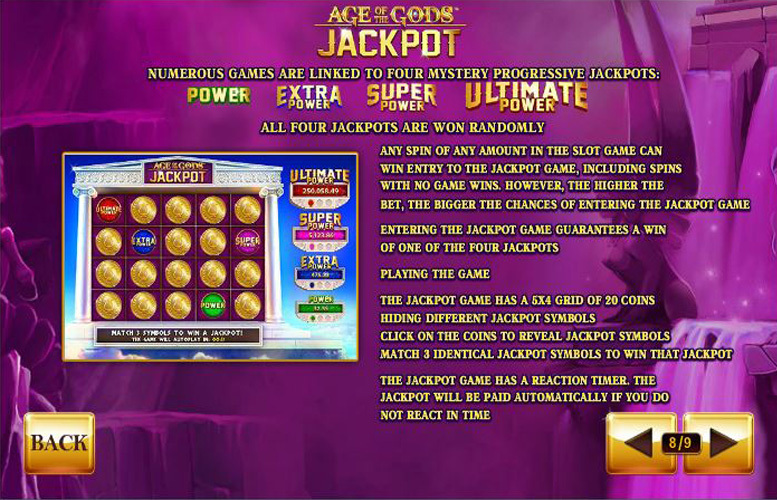 Like a number of Playtech slot games, Age of the Gods is linked to four different progressive jackpots. Players can at random trigger the Jackpot Game which gives them a chance to win one out of the Power, Extra Power, Super Power or Ultimate Power jackpots. Which one they win depends upon their choice in the Jackpot Game. Age of the Gods is themed around Ancient Greece and the pantheon of gods associated with that civilisation and the symbols on its reels reflect that theme. Those symbols depict Greek letters, as well as images of the Greek gods themselves, and it is the latter which are the most valuable behind the slot’s wilds. 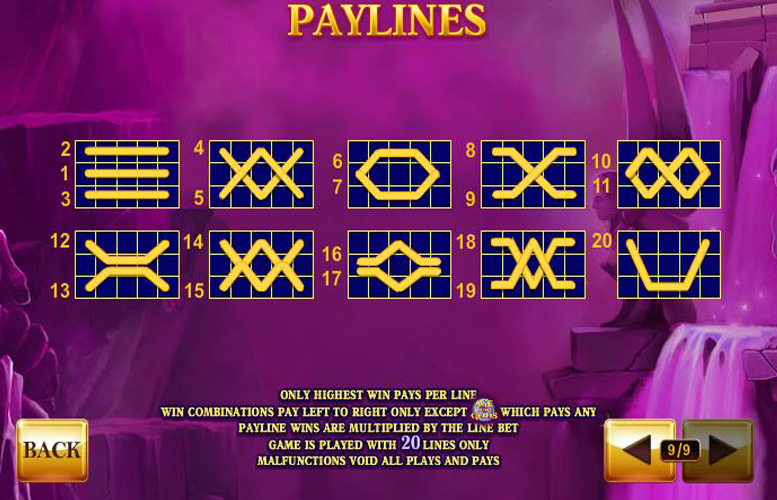 If a player is fortunate enough to see five of the Athena symbols line up along a payline, they will receive a payline jackpot worth 1000 times their bet per line. If a five symbol combination depicting either all Zeus or all Poseidon symbols appears, meanwhile, it leads to a payout worth 500 times the line bet. Unlike a number of similar slot games, Age of the Gods doesn’t actually give players a great deal of options when it comes to their stake amount per spin. The slot, after all, has an unalterable 20 paylines and does not include the choice of changing the number of coins bet per payline either. What the game does allow for is the alteration of a player’s chosen overall bet per line, but even the choices here are somewhat limited. A minimum line bet of 1p is possible and a maximum of £2 is also available, and there are then a handful of choices in between. There are a number of things to like about the Age of the Gods slot but, unfortunately, there are also a few notable downsides to the game which ultimately mean that in the end it falls somewhere in the middle of the online slots pack. Being linked to four potentially huge progressive jackpots is a notable advantage of the Age of the Gods game, but this is unfortunately somewhat negated by the fact that the slot’s own payline jackpots are a little on the low side. A wild symbol and a bonus symbol which triggers a side game that can lead to differently themed free spins, means that gameplay is impressively fun and changeable. What’s more, those additional features also enhance a player’s ability to win good amounts of money but the slot’s limited range of staking options does once again take the shine somewhat off those advantages. This game has a rating of 4 / 5 with 289 total reviews by the users.